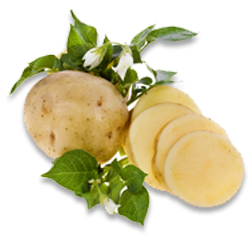 Potatoes (Solanum tuberosum) are the world's most widely grown tuber crop. The high ranges of Kerala are suitable for its cultivation. Presently, the crop is being cultivated on a small scale in the rain shadow areas of Idukki district throughout the year. A day temperature of 20-30ºC is optimum for growth and tuberisation in potato. Tuber formation is adversely affected, if the temperature goes above 30ºC. 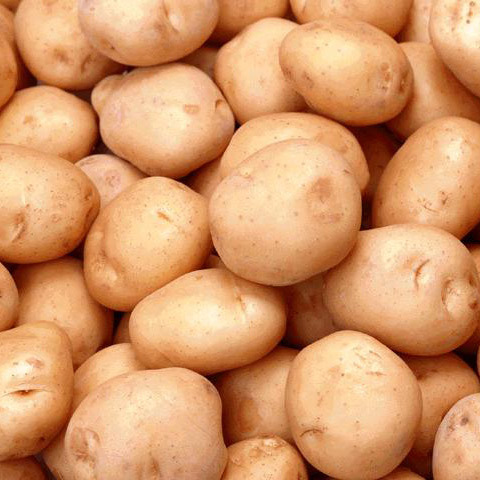 Loose friable sandy loam or silt loam, rich in organic matter are ideal for potato. Hard clay should be avoided. Optimum pH range is 5.2-7.0. Among the high yielding varieties Kufri Jyothi (early), Kufri Muthu (medium) and Kufri Dewa (late) can be tried in the high ranges of Kerala. Potato is propagated by planting tubers. Whole potato tuber or cut pieces (50-60 g size) longitudinally cut from bud end to stem end can be used for plating. For planting 1 ha, 1000-2000 kg seed tubers are required. Seed tubers are treated with 1 ppm of GA3 for one hour and then dried in shade for getting uniform sprouting. Tubers are filled in gunny bags after drying and kept in vertical position in well ventilated dark room for 10 days for encouraging sprouting. Seed pieces should be treated with mancozeb (@ 1 kg in 450 litres of water) before planting to protect them from soil borne diseases. Tubers can be planted on ridges 50-60 cm wide at a spacing of 15-20 cm between the plants. Earthing up is needed during the growing phase (30 days after planting) and 70 days after planting. The shortage of quality seed tubers, high seed cost, difficulty in transportation due to bulkiness of seed tubers, and virus infection in seed tubers are some of the important problems associated with use of seed tubers as planting material. To overcome these problems True Potato Seed (TPS) is used as planting material. TPS is a botanical seed developed in the berry of the plant as a result of fertilization. These seeds are raised for crops commercially. Only 100 g of TPS costing around Rs. 3000/- is sufficient for cultivating in one hectare, as against 2.5t/ha seed tubers, which cost Rs. 20,000-30,000/-, thus effecting a drastic reduction in cost of cultivation. Potato crop can be raised from TPS using seedling transplants or through seedling tubers produced in preceding crop season. In former method, the TPS seedlings raised in nursery beds are transplanted in the field and grown to maturity. While, in latter, the TPS seedlings are grown to maturity in nursery beds to obtain seedling-tubers. These seedling tubers are used as a seed for raising normal potato crop in next season. A basal application of FYM (20 t/ha) is required during field preparation. Apply 60 kg N, 100 kg P2O5 and 120 kg K2O as basal. Topdressing with 60 kg N, 30 days after planting at the time of first earthing up is essential. Irrigation has a special significance in the potato production as the plant has shallow and sparse root system. First irrigation should be light and given 5-7 days after planting and subsequent irrigation are given at 7-15 days interval depending upon the climatic condition and soil type. The drip system of irrigation is most economical and also enables application of fertilizers through irrigation water. The sprinkler system gives uniform distribution of water and reduces water losses by percolation and is suitable for areas with undulating topography. 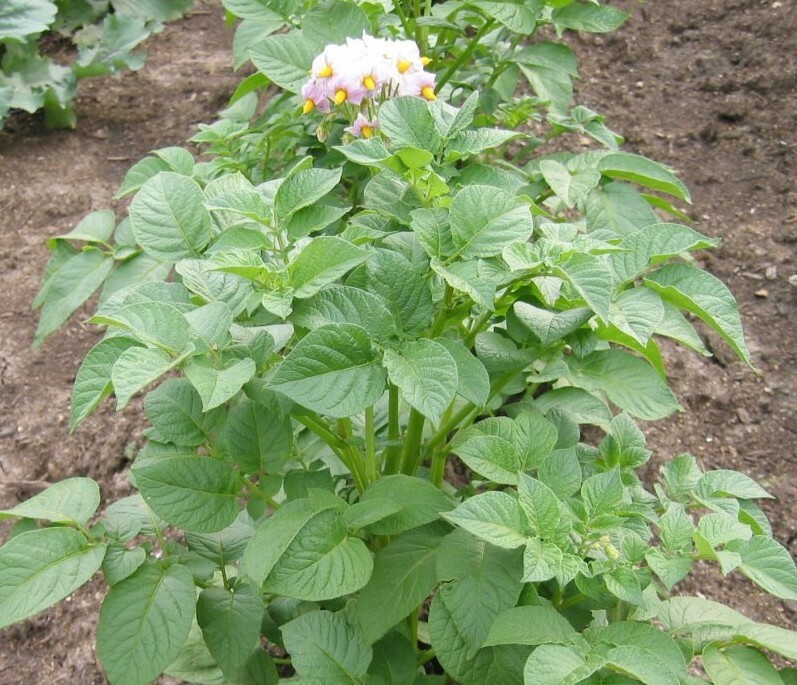 The potato crop develops canopy in about 4 weeks after planting and weeds must be controlled by this time to gain competitive advantage for the crop. If the weeds are large, they should be removed before the ridging operations begin. After earthing up, the weeds between the growing plants and at the top of the ridge should be removed by mechanical or herbicide application. Earthing up helps to keep the soil loose and destroy weeds. Carry out two or three earthing up at an interval of 15-20 days. The first earthing up should be done when the plants are about 15-25 cm high. The second earthing up is often done to cover up the tubers properly. The potato crop can be grown in rotation with paddy, mung, okra, green manure, etc. Early blight and late blight are the important fungal diseases. Spraying zineb (2 g/litre) is effective to control early blight. Copper fungicides can control late blight. Cut worms, aphids and jassids are common pests of potato. Dusting with carbaryl 10 % DP immediately after planting can control cut worms. To control aphids and jassids spraying dimethoate (1 ml/litre) is effective. The time of harvest is very important in potato as the development of tuber continues till vines die. The crop is ready for harvest within 75-120 days of planting, when majority of the leaves turn yellow brown. At this stage, the tops are cut near the ground level. The potatoes are dug out from the field by ploughing after 8-10 days. These potatoes are manually picked from the field and stored in shade. Since manual harvesting is labour intensive, time consuming and causes lot of damage to the tubers, various low cost bullock drawn and tractor drawn potato diggers have been developed. The harvested potatoes are surface dried and kept in heaps for 10-15 days in shade for curing of skin. The tubers should not be exposed to direct sunlight as they become green. All damaged and rotten tubers should be removed. The produce should be kept in a cool place before sending to the market. The average yield of the early-maturing varieties is about 20 t/ha and that of the late varieties about 30 t/ ha.